(PRINCE GEORGE) The Motherlode theatre troupe is “Teaming up the Cariboo Road” as they kick off their summer tour today with a musical preview of their high-energy musical theatre show. The youthful, five-actor troupe filled the Exploration Place in Prince George with song as they launched a marathon tour of British Columbia. The show weaves a rich tapestry of B.C. history, legend and music, bringing the events of B.C.’s gold rushes and their tumultuous results to life. 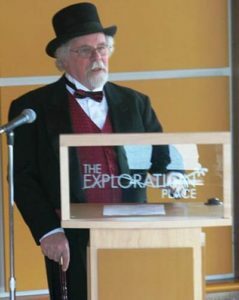 The Motherlode is the result of a partnership between the New Pathways To Gold Society (NPTGS), the Province of British Columbia and the Newman & Wright Theatre Company. The show’s producer, Richard Wright of the Newman & Wright Theatre Company, said he’s thrilled to be able to give his young troupe this opportunity, thanks to the support of BC150, the Tourism Ministry, NPTGS and local sponsors. “Newman & Wright are enthusiastic partners with New Pathways in putting this show together,” said Wright. The show will tour communities from Hope to Barkerville over the summer and also participate in the CP Spirit of 150 Rail Tour from June 12-July 6. Their first performance is scheduled for May 24 in Barkerville before they move on to Ashcroft. NPTGS co-chair Chief Byron Spinks said he’s pleased that The Motherlode includes First Nations stories and perspectives on the often-chaotic events of 1858 and subsequent years. “I think this helps reinforce both BC150’s and the NPTGS’ main pillars of First nations reconciliation,” said Spinks, Chief of the Lytton First Nation. Spinks’ NPTGS co-chair, Chris O’Connor, said The Motherlode offers more than just great show. “The troupe will go into communities and hold workshops to encourage people to share their stories,” said O’Connor, Mayor of Lytton. “Those local stories, including First Nations and multicultural stories, will be incorporated into the next performance. So no two shows will be exactly the same.” Details of the tour schedule are still being finalized and will be available on the tour website or on the NPTGS events calendar (newpathwaystogold.ca). The New Pathways To Gold Society is a community-based organization dedicated to First Nations reconciliation, investment in B.C. heritage and economic development. NPTGS is a non-profit, non-partisan organisation working with communities along the Gold Rush/Spirit Trails corridor from Hope to Barkerville. The Society is dedicated to heritage tourism, First Nations reconciliation and economic development. NPTGS acknowledges the financial support of the B.C. government. Share this story, choose your platform. A non-profit, non-partisan organization, NPTGS partners with First Nations communities, and all three levels of government to develop and deliver projects supporting local economies and creating heritage tourism assets. NPTGS has worked with its partners to build or restore heritage trails, launched/completed 18 major projects and staged 165 events, performances, symposia and lectures. Check out our projects portfolio. A non-profit, non-partisan organization, NPTGS partners with First Nations, communities, and all three levels of government to develop and deliver projects supporting local economies and creating heritage tourism assets.